Now you can DELETE the System32 folder on your Computer and save even more Memory! Deleting the System32 folder might just be the best thing ever happened to you. Is the System32 folder a virus? How to reinstall system32 folder if deleted? All answered in a single piece. Everyone uses the Windows operating system – isn’t it? Okay, it’s obvious that the Windows OS is one of the most popular and widely used in the world. Be you a fan or not, it is here to stay and pretty much comes with quite astonishing files and folders like the System32 folder. You feel like “what da’ heck” are these folders doing on my System? 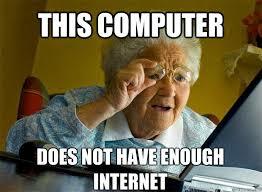 Windows is pretty much handy yet comes along with its own share of problems, bugs and confusion to the end user. We all know the importance of keeping our computer cookie-free, but those that also relate to the different files on Windows OS like the System32 folder? 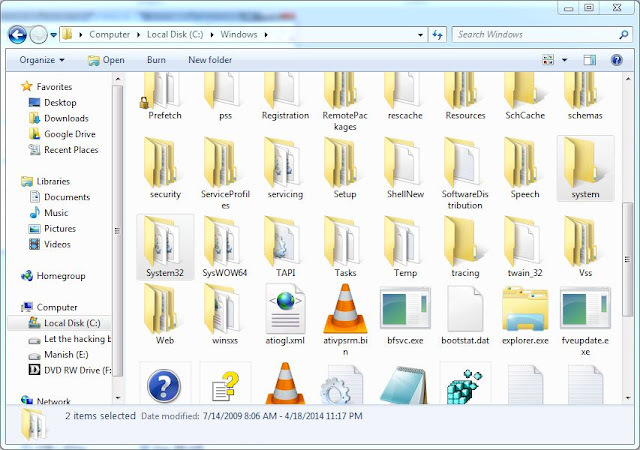 One of the raving issues in the computer world is the issue of having to DELETE SYSTE32 FOLDER on your Windows OS computer or just let or be there. Some individuals might be working on a budget memory space and definitely having these forsaking folders and files around might frankly NEVER be the best decision you’ve made in your entire life. But firstly, what are these junk files on your Windows 7, 8, 10, etc doing them? What to Find in System32 Folder! Many of the files inside the System32 folder take the form of DLL (Dynamic Link Libraries). These files contain codes and data that can be accessed and shared by many programs including your Windows OS. These files inside the System32 folders enables total system functionality from your control panel options, system updates, most of your drivers, streaming media support (YouTube) and even the Windows interface itself – pretty weird booting your computer and seeing nothing but a Blue space. Why Delete the System32 Folder – IF YOU SHOULD! "Deleting the System32 folder will make your computer and internet connection run twice as fast"
Recently also, a guy claimed that Microsoft intends to maximize the profit from their Operating System since many folks like pirating their Os. SO, the introduction of many Microsoft Pc cleaning tools will help delete the many craps usually found in the system32 folder. All Lies? Many computer geeks quite straight away claim it to be a system malware and also providing you with a step-by-step instruction directing users to enter several lines of code on a command prompt to delete the folder! Hmmm!!! 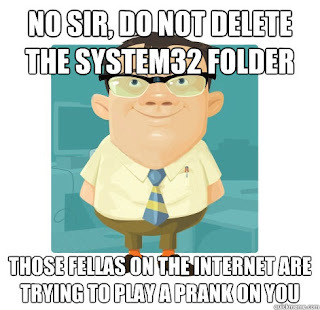 How do you delete system32? How do you reinstall System32? Is it true that System32 is a virus? What will happen if you delete System32? I have got a message for you in the next paragraph which more or less answers you many persistent and constant occurring questions. 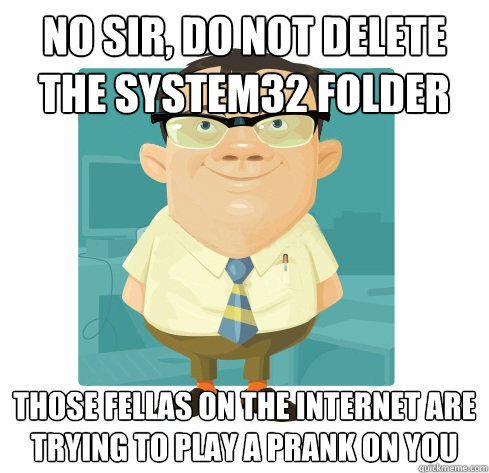 So, the more of the story is – don’t delete the System32 folder or anything in it neither take computer maintenance instructions from deceptive folks out there claiming what they are not. Always seek the advice of a certified Windows personnel or good maintenance centre if you must delete the System32 Folder. Trillionclues - Technology Market | Review | DIY Guides: Now you can DELETE the System32 folder on your Computer and save even more Memory!